The Lucknow Residency, is a cluster of buildings ruins that were built in 18th century by the then Nawab of Oudh, Nawab Saadat Ali Khan. Purpose of the complex was to serve as the residence of the British Resident General who was a representative in the court of the Nawab. Later, it became a place of National importance when it witnessed the famous revolt of 1857, which shook the then-British regime. 1857 saw the Sepoy Mutiny, which is also sometimes referred as 'The First War of Indian Independence'. During the revolt, this red-brick building was the refuge of around 2000 British natives, out of which only around 1000 survived. 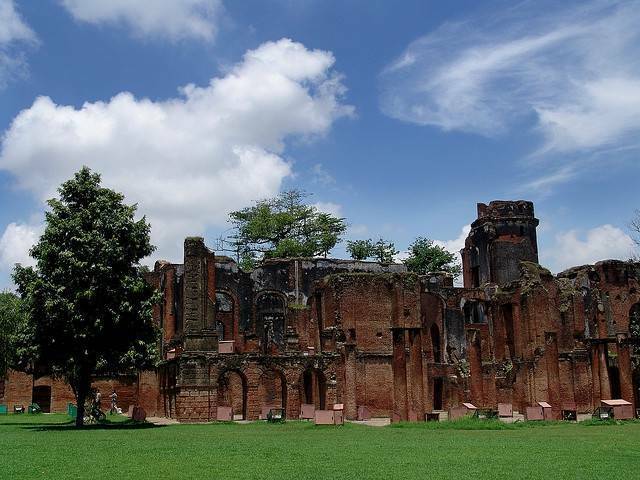 Now in ruins, the Lucknow Residency has been declared a protected monument by the Archaeological Survey of India. Lucknow Residency has a cemetery which has graves of the British soldiers who died in the Revolt. It’s definitely a must visit place when in Lucknow. The ruins bear the scars of cannon-balls and hundred bullet marks. It provides an insight into the colonial behavior of the English and you get a sense of time being frozen in the past. Today, the complex houses a museum, which has paintings and photographs of bygone eras.